‘A Serious Man’ is, in fact, not very serious at all. It is a serious movie, but at times, it can be incredibly funny. In fact, in terms for follow ups to their own films, I’d put it closer to ‘Burn After Reading’ than ‘No Country for Old Men’. It is pretty funny in parts, but having said that, the humour comes from the gravity of the situations. Fazil wrote about the Jewishness of the film, but for my part, I don’t know how important that is. As in, I don’t know whether you have to be a Jew to enjoy it. Having said that, I do wonder whether they overdid it a bit on the symbolism and content. If ever there is a filmmaker (team) that celebrates Judaism to the point of making it a central figure of their films, it’ll be the Coen brothers. And if ever there is a film that doesn’t merely touch upon, but gave the Jewish principles a bear’s hug (or at least takes a very unrelenting look at them), then ‘A Serious Man’ may well be one of the main contenders for the prize. 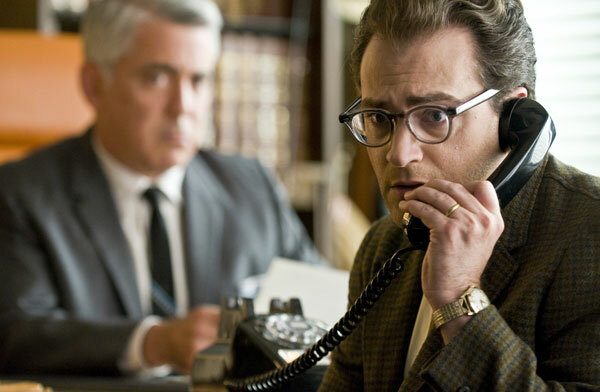 We follow a man named Larry Gopnik (Michael Stuhlbarg), a man who lives what appears to be the perfect American dream. He is a part of the typical nuclear families that is presented as ideal at the time (the 60s), the owner of a lovely car and an even lovelier suburban house straight out of the American dream factory, and he has the respectable job of being a college professor of physics. His children all attend the local Jewish school, so that they are able to be schooled in the proper way, so to speak, while he himself appears to be on the cusp of being promoted. Life seems to be perfect, right? Wrong. "Yes, I do wax. It's a Superman." The American Dream very quickly becomes one that even the young female horses after sunset (i.e. nightmares) have nightmares about. Though his son is enrolled in a Jewish school, he is involved in the very unJewish (and un-religious, for that matter) activity of smoking pot. This doesn’t quite compare (or does it?) to his daughter Sarah, who believes that the only way ahead in life is to be hankering her father for a nose job. His brother, Arthur (Richard Kind), is something of a mental wreck, having lost his home and job, and lives with them obtrusively. He has a Korean student at his college who is willing to bribe Larry so that he’ll get a decent mark for an important test. Worst of all, his wife Judith (Sari Lennick) wants out of their marriage in order to shack up (that sounds vulgar, but as I’m writing this, it sounded so funny in my head it made me laugh, so I’m putting it in here) with their family friend, Sy Ableman (Fred Melamed). It’s all quite bewildering for our Larry here, and unfortunately, he couldn’t quite make the head and tail of it. And for the most part, that was pretty much the experience that I had watching this film as well: I couldn’t quite place my finger on the film itself. 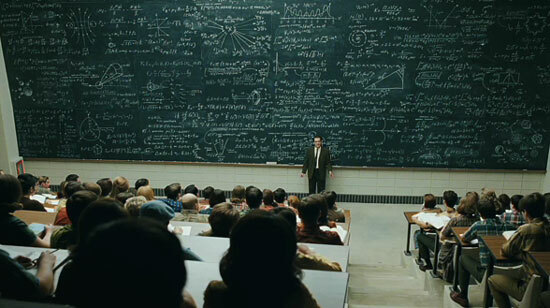 Most films have an easily identifiable cause-and-effect system at work, but here, ‘A Serious Man’ seems to try to break away from that particular structure, at least on this small level. Things just happen to Larry, and he doesn’t know why. There is a clear link to God’s treatment of Job in the Book of Job, but if anything, it may well prove that even religious texts doesn’t automatically make for fine cinematic adaptations (not that it hasn’t been done before). Things just happen to Larry, and he doesn’t know why. Even after he paid, they wouldn't release the hostages. What I do know is the feeling of rage and powerlessness that Larry goes through. That’s not to suggest that I know on the same level the same frustrations he feels (though doubtless each and every one of us will be able to relate). It is the indignity and humiliation that he is being put through. His wife decides to up and leave him, and asks him to move out of the house, so that Sy can move in, and she cleans out their joint accounts while she’s at it! “Think of the children, Larry,” they reasoned with him, and so he feebly moves out. His children has nothing that resembles any form of respect whatsoever. His first night after being kicked out of the house, Danny comes to the table, wondering where his father is, as an afterthought to what’s for dinner, and wonders when his dad is coming home to fix the TV antennae. What makes me even more outraged is his own reaction, which is feeble and weak. His is a weak character, a pathetic man without much of a backbone. He takes it all on himself, and wonders why, why, oh why me? What did I do? I didn’t do anything! Perhaps it is telling that he is a physics professor in a Jewish movie. It seems to be at odds, in a way, a clash between logic and faith, between science and religion. As a man, evidently he believes in science (although it doesn’t mean that he knows everything about it; see the cat sequence). That may well help to explain his predicament, of wanting to know why these things are happening when he hasn’t done anything wrong. But then again, life itself is not an exact science. This things happen, for a variety of reasons. 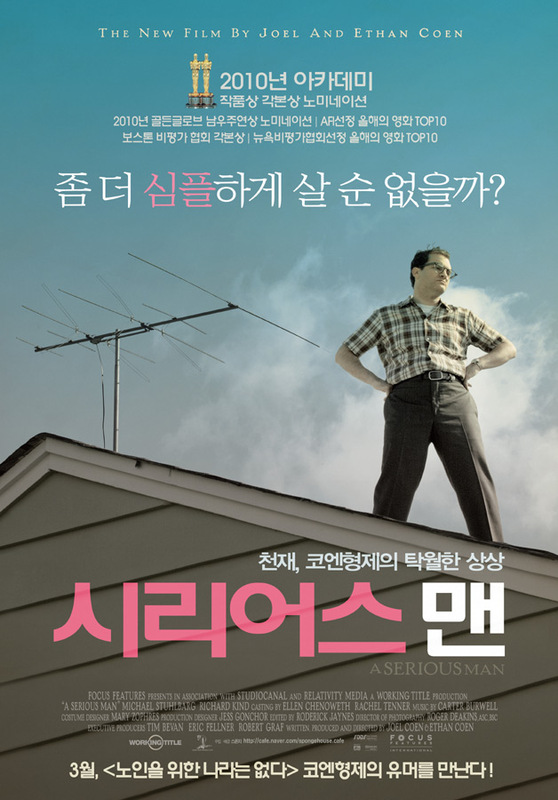 Be it God, another force at work, nature itself, or simply plain pure dumb luck, ‘A Serious Man’ presents us a character to whom bad things happen for no apparent reason. "Memorise this, and you'll be fine." But tellingly, this film is not an aimless one. After all, the Coen brothers are master filmmakers in their own right, and it’s not really their way of just putting things in, jumbling them up, and then leaving it all on the silver screen, saying, “Make of that what you will!” Even though a lot of things doesn’t seem to be making much sense to both us and Larry, there is a build up. There is development, there is tension, there is conflict, and there is a resolution (if you may be permitted to call it that). Expectations are built by way of repetition. Danny runs away from his pot dealer, knowing full well that he owes him money. It happens more than once, and each time, our expectations are built. The same goes for Larry’s attempt to look for help for his perceived ails. He tries the spiritual route, and is referred to not one, not two, but three different rabbis. Each one of them has their own way of trying to help him, but more tellingly, each one of them is more outrageous than the one before: “Look at the parking lot! Look at how beautiful it is!” This is where the comedy comes from, from the building of expectations through repetition, and then shattering them in different ways, at times for comedic effect. Robert Rodriguez had no idea how to structure a feature film for his first film, but he knows how to make short films, and so in ‘El Mariachi’, we see a lot of repetition, because he’s basically making one short film each for the beginning, middle and end. It made for a very involving film, one that plays with our expectations and makes us forget about its low budget. The same things happen here, and each time they are escalated to a higher level. Larry’s Korean student tries to bribe him; failing that, his father went to Larry’s home and raised the stakes higher. It’s interesting, this; the film itself started out with a part that seems totally disconnected with the main narrative of the film, a Jewish prologue about dead spirits. It’s lovingly made, but it could stand very well on its own two feet, rather than included as a part of a feature film. Then again, this film doesn’t really make much sense, in some ways, but there is emotional attachment and development. It’s helped along by some fantastic acting by Michael Stuhlbarg in the lead role. Apparently he’s a famous theatre actor. He should have been nominated for an Oscar for this role. Why is the poster Korean? I saw it in Korea.